It is fair to say that Bill Haley & his Comets had a great run, both in the US and in Europe, but while their popularity did decline in the US shortly after Elvis Presley arrived on the music scene, in the UK and the European mainland, it never did. So what was the reason for the US popularity decline? Bill Haley & his Comets had a certain style that they developed by watching the sort of things the younger generation were responding too, so while their stage presence saw more wilder movements than had the norm been in the early 1950s, nothing prepared them or the general public to the swinging hips of Elvis Presley. Elvis caused a huge stir amongst the more conservative members of the population who tried to have him banned from radio play, they tried to stop their children from listening to his music and they hated his provocative dance moves. While Bill Haley & his Comets were the catalyst of the new Rock ‘n’ Roll movement, Elvis picked that up and ran with it so hard, he became known as the King of Rock ‘n’ Roll. All those who came before him seemed to be forgotten, including Bill Haley. But not in Europe. 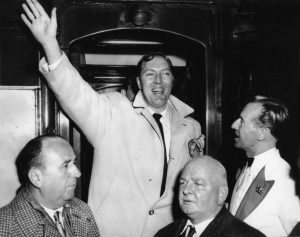 In 1957, Bill Haley & his Comets toured the UK and were mobbed by thousands of adoring fans at Waterloo Station. They kept up this momentum throughout mainland Europe and as far away as Australia. Even a decade later, they remained as popular as ever in Europe, while back home, in the States, they were considered ‘oldies’. A Rock ‘n’ Roll Revival tour was organised in 1969, and at one of these shows, Bill Haley & his Comets a received standing ovation lasting 8 and a half minutes. With their hits making film and TV soundtracks (American Graffiti and Happy Days to name just two), Bill Haley & his Comets are sure to remain in peoples hearts forever.